The Ghosts of Heaven was printed in Golden Ratio, from which the logarithmic spiral can be derived. 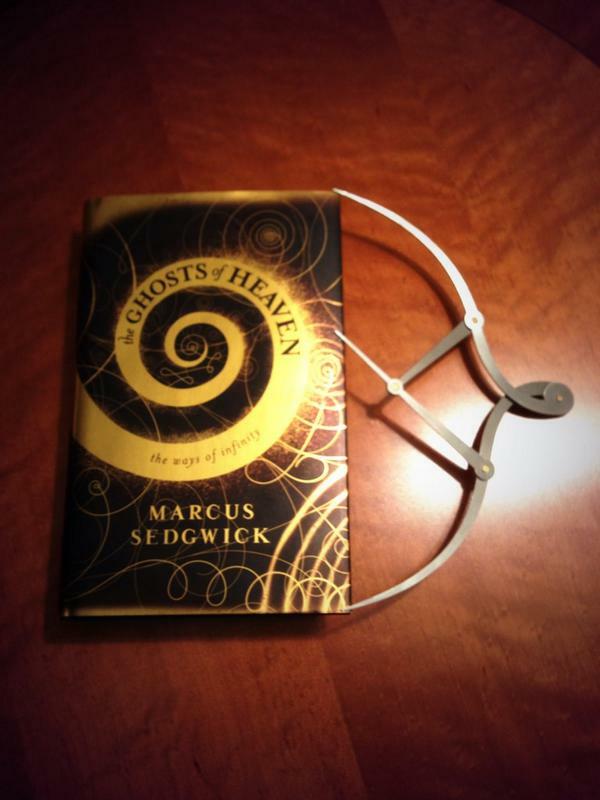 The Ghosts of Heaven, by Marcus Sedgwick, contains four separate yet interconnected stories that wind through time like the spiral from which they are each inspired. The writing is lyrical with dark undercurrents, disturbing in places yet full of hope. It is suggested that the tales may be read in any order and still make sense. Certainly each stands on its own but also adds depth to those read before. The first quarter of the book is set in the time of prehistoric hunter gatherers when marks in caves were linked to magic and writing had not yet been invented. The second quarter introduces us to a young girl, newly orphaned, who becomes the victim of a powerful church hunting down witches. The third quarter is set in the last century at a lunatic asylum where the lines between madness and sanity become blurred. The fourth quarter is set in a futuristic spaceship where a lone sentinel discovers that all is not as it seems. Each tale is richly imagined with compelling story lines and intelligent, questioning characters. It is the questions that they ask, the thought processes they explore, that add to the intrigue. The reader is lead to philosophise alongside, to consider where they have come from, why they are there, and where they may be going. Although classified as for Young Adults I enjoyed this book for what it is, a work of fiction that entertains and gently challenges without preaching. The darkness that has always existed in the hearts of some men is examined alongside a perception of supposed progress. The denouement of the final tale is pitch-perfect. Four quarters make a whole and life goes on, spiralling ever upwards or downwards depending on how it is viewed. It takes skill to present complex ideas in such an accessible way. This book is story telling at its best. My copy of this book was provided gratis by the publisher through Goodreads as a ‘First Reads’ giveaway. This entry was posted in Book Review and tagged Indigo, Marcus Sedgwick, Orion Books, The Ghosts of Heaven, the ways of infinity.